"Woods Hole Oceanographic Institution is a private, nonprofit research and higher education institution dedicated to the study of all aspects of marine science and engineering and to the education of marine researchers. Established in 1930, it is the largest independent oceanographic research institution in the United States. Its shore-based facilities are headquartered in the village of Woods Hole, Massachusetts. Ships operated by WHOI carry research scientists throughout the world's oceans. WHOI operates several research vessels, owned by the United States Navy, the National Science Foundation, or the Institute itself." 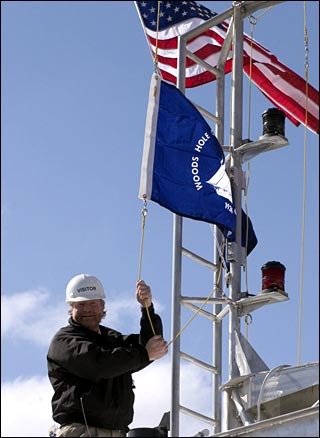 A photo shows the flag of Woods Hole Oceanographic Institution, as flown from its research vessels, is blue with the WHOI seal displayed in white.